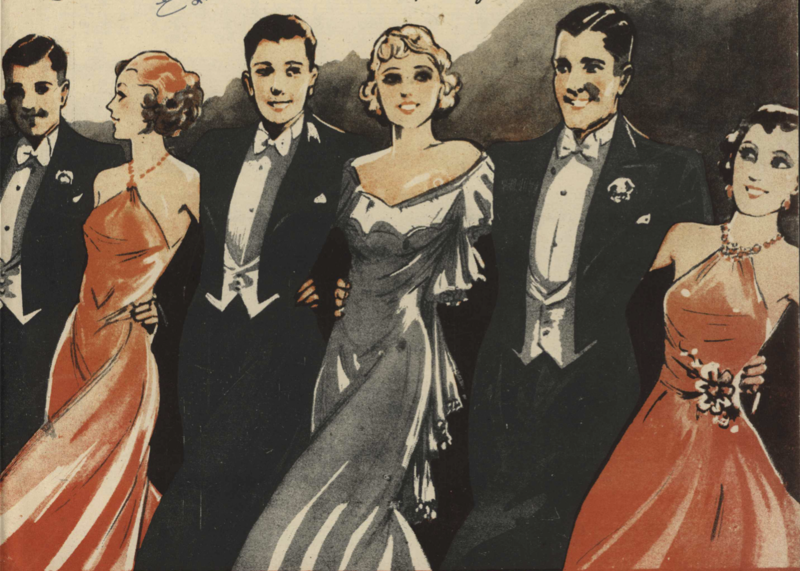 Dating back to the mid-1930s, the Palais Glide is an English sequence dance performed in lines of couples — an early, swing-era "line dance" of sorts. Danced in lines (of couples or dancers), as illustrated above, with arms linked behind, facing LOD around the room. All dancers start with the left foot. 1: Point left heel forward diagonally to the center of the room, without weight. 2: Cross left foot behind right. 3: Cross left foot in front of right. 4: Point right heel forward diagonally to the outside wall, without weight. 5: Cross right foot behind left. 6: Cross right foot in front of left. 7: Point left heel forward diagonally to the center of the room, without weight. 8: Cross left foot behind right. 1: Cross left foot in front of right. 2: Cross right foot in front of left. 4: Cross right foot in front of left. 5: Step forward with left foot, leaning forward slightly. 6: Swing right foot forward from rear. 7: Step forward with right foot. and: Step forward with left foot. 8: Step forward with right foot. Repeat from the beginning, gradually traveling around the room. Here's another video, and a picture of (an exaggerated version of) the lean forward. Many different songs were recommended for the Palais Glide, and pretty much anything in 4/4 time with eight bar phrases will do. All together side by side. All you've got to do is take your step from me! Swaying in the Palais Glide! The Original Palais Glide (1938) gives a nine-song medley "Poor Little Angeline," "Rusty and Dusty," "Old Folks at Home," "The Sunset Trail," "Loch Lomond," "Pop Goes the Weasel," "The Miller's Daughter Marianne," "Il Trovatore," and "Ten Pretty Girls." Sheet music for "When Granny Wore Her Crinoline" (1938) proclaims it to be "the most popular of all Palais Glides." Taylor's Old Time and Novelty Dances (1944/1947) recommends "The Policeman's Holiday," while noting that "many others are available." D. T. Foster. (1935). The Palais Glide. London. Thanks to Richard Powers and Susan de Guardiola, whose own detailed descriptions and teachings of the Palais Glide I have drawn from in creating this page.